I love it. what white ink did you used for the Polka dots? I need to try this!!!! I love it too.Very clean and simple great card. Holy cow... This is just GORGEOUS!! Ooh, that is just way tooo cute! Love this, it makes me happy! Your colors just pop! You're not just wishing sunsine, you're sending it! That card would be a burst of sunshine coming out of an envelope. Nice job! I love the sunshiny colors. And the sentiment is perfect for sending to someone living in a northern climate where it's cold and snowing (yet again). I love that card. it is so lovely! Very cute, Natasha. 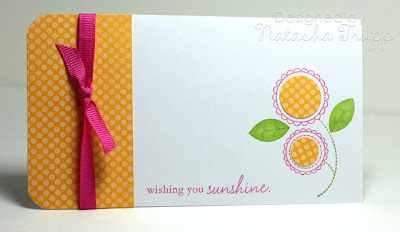 It's a smiley card -- makes me smile! Great card love colors and style very pretty. Love what you've done here. Wonder if it would be as effective with the SU stamp set Seeing Spots... only one way to find out! What a sweet little card! Those flowers are too cute!